Patients with hopeless residual dentition due to advanced periodontal disease or failing fixed or removable partial dentures frequently present with difficulties and concerns regarding the provisional phase until their final prosthetic restoration. As removable dentures are generally not preferred – not even as a provisional – the transition to a fixed rehabilitation should be quick, aesthetically appealing and restoring function in terms of chewing as well as phonetics. The immediate All-on-4® implant treatment concept at the Academy for Oral Implantology in Vienna (Austria) relies on implant placement at the day of tooth extraction and immediate fixed restoration within a few hours. The key factor is the placement of angulated implants (to avoid vital anatomic structures as well as invasive bone grafting procedures) that allows for immediate occlusal loading due to the increased anchorage in the native jawbone. Highly aesthetic provisional implant bridges can thus be provided at the day of surgery. The loss of all teeth in the upper and/or lower jaw is one of the worst events in a dental patient's medical history. By instinct, the majority aims at keeping their natural dentition as long as possible until old age. Removable dentures are frequently applied, however, offer only weak rehabilitation in terms of aesthetics as well as chewing function. Most of the denture patients have to change their eating and chewing habits and thus suffer from various forms of malnutrition. 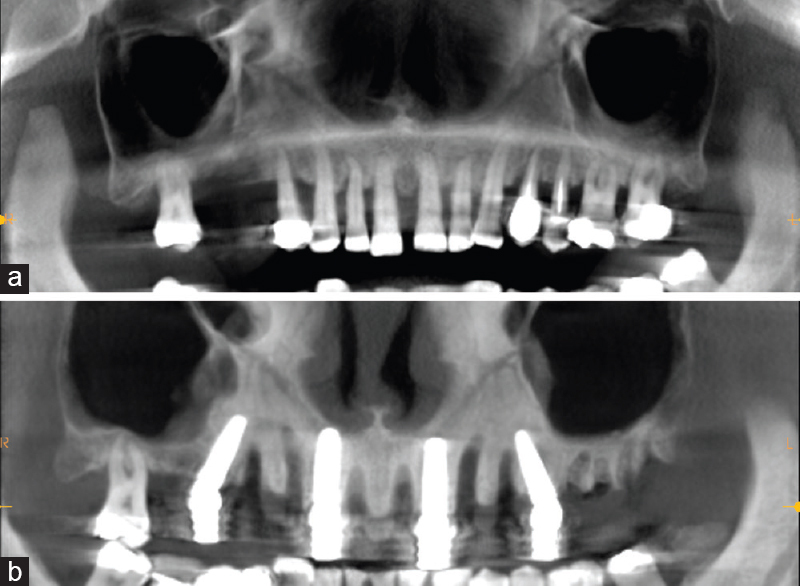 Instability of prostheses is particularly common in the maxilla and – along with tooth mobility – carries the potential to compromise the patients' quality of life and social activities. A pleasant transition to a fixed and aesthetically appealing restoration [Figure 1] is, therefore, of uttermost importance for the majority of patients, most of them presenting with less than enough stable residual teeth to allow for fixed bridges on natural teeth. Rehabilitation of the edentulous jaw using dental implants has thus gained popularity over the past decade and enables immediate fixed provisionals that are highly appreciated by the patient. What Is a Failing Dentition? When single tooth has to be extracted – due to carious lesions, failing endodontic treatment, progressive periodontal disease [Figure 2] or trauma – the gaps are initially closed using fixed bridges, single-tooth implants or removable dentures. When more and more teeth get lost over the years in a patient's mouth, frequently due to tooth loosening caused by chronic periodontitis, the replacement teeth are added to the existing removable or larger bridges on teeth or implants are built. One factor that is often overseen is, however, that the residual teeth that act as abutments in a large bridge carry the additional load of the teeth to be replaced, and therefore exhibit problems themselves sooner than without having served as bridge pillars. Accessory problems occur as periodontal disease is routinely intensified due to the impaired access to oral hygiene under the bridgework. The question often arises, at what time point the patient's dentition may be designated as 'failed'. Severe mobility of the existing fixed or removable partial denture is certainly a good indication that the situation is not any longer stable and may deteriorate quickly in the near future. When implant treatment is planned, however, the available bone for implant placement is naturally limited by the pneumatisation of the maxillary sinuses (in the upper jaw) as well as the intraosseous course of the mandibular nerve (in the lower jaw). When these anatomic limitations are paired with a significant crestal bone loss due to long periods of edentulism or severe progression of periodontal disease, the native bone available for implant placement may not suffice  and invasive bone grafting procedures are needed that significantly prolong the treatment time and increase post-operative morbidity. For this very reason, it seems recommendable in a high percentage of patient cases to initiate implant therapy at an earlier stage instead of delaying treatment until absolutely necessary. 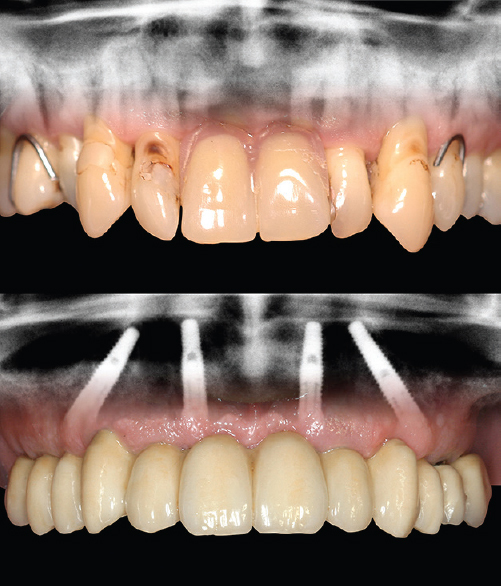 Immediate transition from a failing dentition to immediate full-arch implant bridges (All-on-4®) offers the major advantages of (a) minimally invasive surgery and reduced patient morbidity, (b) clinical success rates above 95%, (c) complete avoidance of removable provisional associated with high patient satisfaction  and stable long-term aesthetic results. There are several advantages of inserting dental implants at the time of tooth removal as follows: first of all, there is no need for soft-tissue incisions, and consequently, no sutures have to be applied. The roots of the teeth furthermore provide essential orientation on the X-ray [Figure 3] when aiming to avoid vital anatomic structures, i.e., the maxillary sinuses in the upper jaw and the mandibular nerve (and the mental foramen, respectively) in the lower jaw. The concept of All-on-4® involves the placement of two straight implants in the anterior part (1 per side, typically in the lateral incisor region) and two angulated implants in the posterior part (typically in the second pre-molar region). The angulation of 17°–30° serves three reasons as follows: the recommended safety distance of the maxillary sinuses or mental foramina can be respected, the bony anchorage of tilted implants in native jawbone is increased and the maximised anterior-posterior spread provides a stable support for distal cantilevers of the implant bridge. With the help of three-dimensional (3D) radiographic images (cone-beam computed tomography), implant surgery can be performed in a minimally invasive procedure, thus obviating the need for risky bone augmentation procedures. Using 3D treatment planning software that allows to superimpose the radiographic information and intraoral optical scans of the soft tissues, implant positions are determined before the surgery already. The pre-operative workup not only shortens the surgical intervention significantly but also helps to make the outcome of implant therapy more predictable and safe. Full-arch implant placement nowadays yields success rates above 95% and is an everyday routine procedure at the academy. The possibility of providing fixed implant bridges at the day of tooth removal and immediate implant placement is one of the major benefits of the All-on-4® concept. The exact implant positions are recorded directly after placement through conventional or optical impressions, and the digital workflow computer-aided design/computer-aided manufacturing allows to fabricate provisional implant bridges made of poly-methyl-methacrylate within 3–4 h after surgery. Scientific evidence supports the concept of immediate implant loading  as long as essential guidelines are followed. These involve avoidance of bridge cantilevers that extend beyond the most distal implant and a well-balanced occlusal relationship. Compared to the immediate loading of single-tooth implants, there is a substantially reduced risk of overload when splinting all four implants in a full-arch restoration. Patient satisfaction with an immediate transition to fixed implant bridges is exceptionally high  as the need for removable provisional is completely circumvented. Patients do not need to adapt their speech and chewing patterns to a provisional denture that covers the gums and the palate. The major disadvantage of removable provisional dentures is that patients have to readapt their phonetics and mastication a second time after the period of implant osseointegration. By contrast, immediate fixed implant restoration preserves the integrity of the temporomandibular joint function and does not interfere with established occlusion patterns. Most importantly, the natural appearance of soft-tissue level and margin can be maintained, and consequently the aesthetic outcome after immediate implant restoration outperforms the results possible with other techniques of full-arch rehabilitation [Figure 4]. Pommer B, Hingsammer L, Haas R, Mailath-Pokorny G, Busenlechner D, Watzek G, et al. Denture-related biomechanical factors for fixed partial dentures retained on short dental implants. Int J Prosthodont 2015;28:412-4. Mailath-Pokorny G, Fürhauser R, Pommer B. New anterior teeth – The same day: The immediate-placement concept of the academy of oral implantology in Vienna. Eur J Dent Implantol 2015;11:46-9. Pommer B, Haas R, Mailath-Pokorny G, Fürhauser R, Watzek G, Busenlechner D, et al. Periimplantitis treatment: Long-term comparison of laser decontamination and implantoplasty surgery. Implant Dent 2016;25:646-9. Hingsammer L, Watzek G, Pommer B. The influence of crown-to-implant ratio on marginal bone levels around splinted short dental implants: A radiological and clincial short term analysis. Clin Implant Dent Relat Res 2017;19:1090-8. Pommer B, Unger E, Busenlechner D, Haas R, Mailath-Pokorny G, Fürhauser R, et al. Graft remodeling following transcrestal sinus floor elevation via the Gel-Pressure Technique (GPT) and pasteous nano-crystalline hydroxyapatite bone substitute. Materials 2015;8:3210-20. Schwarz L, Schiebel V, Hof M, Ulm C, Watzek G, Pommer B, et al. Risk factors of membrane perforation and postoperative complications in sinus floor elevation surgery: Review of 407 augmentation procedures. J Oral Maxillofac Surg 2015;73:1275-82. Busenlechner D, Mailath-Pokorny G, Haas R, Fürhauser R, Eder C, Pommer B, et al. Graftless full-arch implant rehabilitation with interantral implants and immediate or delayed loading-part II: Transition from the failing maxillary dentition. Int J Oral Maxillofac Implants 2016;31:1150-5. Fürhauser R, Mailath-Pokorny G, Haas R, Busenlechner D, Watzek G, Pommer B. Patient-perceived morbidity and subjective functional impairment following immediate transition from a failing dentition to all-on-4® fixed implant rehabilitation. Int J Oral Maxillofac Implants 2016;31:651-6. Pommer B, Tepper G, Gahleitner A, Zechner W, Watzek G. New safety margins for chin bone harvesting based on the course of the mandibular incisive canal in CT. Clin Oral Implants Res 2008;19:1312-6. Busenlechner D, Mailath-Pokorny G, Haas R, Fürhauser R, Eder C, Pommer B, et al. Graftless full-arch implant rehabilitation with interantral implants and immediate or delayed loading-part I: Reconstruction of the edentulous maxilla. Int J Oral Maxillofac Implants 2016;31:900-5. Pommer B, Busenlechner D, Fürhauser R, Watzek G, Mailath-Pokorny G, Haas R, et al. Trends in techniques to avoid bone augmentation surgery: Application of short implants, narrow-diameter implants and guided surgery. J Craniomaxillofac Surg 2016;44:1630-4. Busenlechner D, Fürhauser R, Haas R, Watzek G, Mailath G, Pommer B, et al. Long-term implant success at the academy for oral implantology: 8-year follow-up and risk factor analysis. J Periodontal Implant Sci 2014;44:102-8. Pommer B, Becker K, Arnhart C, Fabian F, Rathe F, Stigler RG, et al. How meta-analytic evidence impacts clinical decision making in oral implantology: A Delphi opinion poll. Clin Oral Implants Res 2016;27:282-7. Fürhauser R, Mailath-Pokorny G, Haas R, Busenlechner D, Watzek G, Pommer B, et al. Immediate restoration of immediate implants in the esthetic zone of the maxilla via the copy-abutment technique: 5-year follow-up of pink esthetic scores. Clin Implant Dent Relat Res 2017;19:28-37. Pommer B, Mailath-Pokorny G, Haas R, Busenlechner D, Fürhauser R, Watzek G, et al. Patients' preferences towards minimally invasive treatment alternatives for implant rehabilitation of edentulous jaws. Eur J Oral Implantol 2014;7 Suppl 2:S91-109. Fürhauser R, Mailath-Pokorny G, Haas R, Busenlechner D, Watzek G, Pommer B, et al. Esthetics of flapless single-tooth implants in the anterior maxilla using guided surgery: Association of three-dimensional accuracy and pink esthetic score. Clin Implant Dent Relat Res 2015;17 Suppl 2:e427-33.